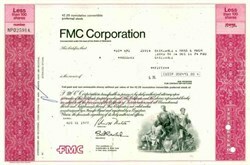 Beautifully engraved certificate from the FMC Corporation issued in 1976-1977. 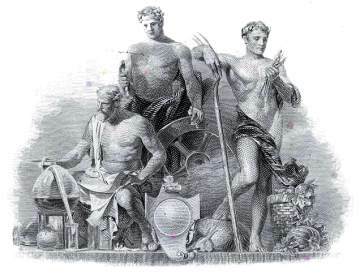 This historic document was printed by the American Banknote Company and has an ornate border around it with a vignette of allegorical men. This item has the printed signatures of the Company’s President and Secretary and is over 25 years old. Feeding the world, protecting health, and providing the conveniences of life is the mission of FMC. FMC maintains leading positions in three chemical markets: Agricultural, Specialty, and Industrial. Ever since their beginning in California in 1883 when John Bean invented the first piston sprayer for agriculture, FMC has continued a proud heritage of pioneering solutions for our customers. Today, they use an array of advanced technologies in research and development, mining and manufacturing to produce customized products and solutions for the many markets they serve. FMC provides innovative and cost-effective solutions to food and agriculture, pharmaceutical, pulp and paper, textiles, glass and ceramics, rubber and plastics, lubricants, structural pest control, turf & ornamental markets, specialty and related industries.